After a natural disaster, the power supply is frequently interrupted. You may have taken every precaution you can think of to protect your family during aninitial disaster. You may have created a safe room with walls that are virtually impenetrable and feature impact and blast resistant doors. You may have appropriate air filtration in place, and food and water for a few days after the disaster. But what about power?Solar panels enable you to run generators, and use other electrical appliances before electric service is restored to your area. They use renewable energy from the sun and are simple to install and easy to use. They are also a clean and environmentally friendly way of using energy, and can save you money now by their use in place of utilities today. Panels are comprised of individual solar cells that function much like large semiconductors. When these cells are exposed to sunlight, diodes inside them convert the energy into usable electricity. The more solar cells in an individual panel, and the higher the quality of these cells, the more total electrical output. The conversion of sunlight to usable electrical energy is called the Photovoltaic effect. 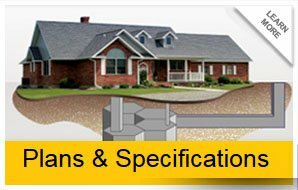 When creating a safe room in your home one of the most important considerations is the ingress and egress from the room. 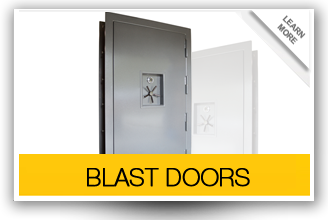 Impact and blast resistant doors are required entrance and exit barriers that must be used for a room to be truly safe. Our doors are designed to resist a high pressure shock front of short duration. When a bomb is detonated, there is a violent release of energy in the form of a gas. This gives rise to sudden, extremely forceful energy termed a blast wave. The almost instantaneous rise from normal pressure to this blast wave is called ‘peak incident over-pressure’ and it is important to assure your door will handle appropriate measures of this force.Another important factor to consider is ventilation. A small shelter or safe room will quickly become intolerable both in temperature and in oxygen level in a fully sealed room. 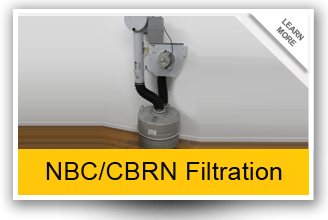 Solar panels are sometimes used to power these NBC filtration units. When you add it all up, Disaster Bunkers is clearly the best choice.